Salmonidae redirects here. For the biblical person, see Salmon (Bible). 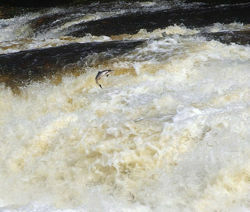 Salmon travel upstream to spawn. Salmon has amazing nutritional value. Fish, salmon in particular, have many benefits to the body. One serving of Chinook salmon contains more than 1/2 of the amount of protein your body needs in a day. It also contains more than 100% of your daily amount of Vitamin D as well as 83% of the omega-3 fatty acids you need. Omega-3 fatty acids are probably the most beneficial part of consuming this fish. They keep your body stabilized and are good for many different systems in your body. Overall it can help your heart by preventing erratic heart rhythms and making blood less likely to clot in arteries, while it also improves bad cholesterol. Some specific things that it does are: increase heart rate variability (HRV) which means that it reduces arrhythmia. It will lower your blood pressure to consume more fatty acids as well as lowering obesity by controlling specific hormones such as leptin. It can improve blood flow and it has anti-inflammatory qualities. Because it is an anti-inflammatory, it can prevent sunburns. Ultimately, eating more fish has been found to reduce the risk of certain cancers. If eaten 2 times a week it can reduce the risks for postmenopausal, diabetic, women. Eating a little bit of fish everyday can definitely lower the risk of coronary heart disease, and when eaten only 1-3 times per month it will lower the risk of a stroke. Overall, eating salmon will definitely improve the health of your body. salmon run takes place on the Humber River in the City of Toronto. Family Salmonidae Tanya Dewey. Animal Diversity Web. Family Salmonidae (Trout) Discover Life in America. Salmonidae Michael Allaby. Highbeam Encyclopedia. Salmonidae (fish family) Enclyclopedia Brittanica. Chinook Salmon (Oncorhynchus tshawytscha) NOAA Office of Protected Resources. 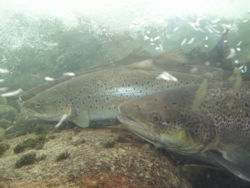 Salmo salar Atlantic salmon Vanessa Renzi. Animal Diversity Web. Salmon The World’s Healthiest Foods. This page was last modified on 28 July 2014, at 22:30.